bordado à mão com fio norte e de juta. I’ve found this Chinese knot in Deepa’s blog, that I love following. She teaches some peculiar stitches from India where she lives. Take a look at her blog – is lovely! Encontrei este nó Chinês no blogue da Deepa, que gosto muito de seguir. Lá ensina alguns pontos invulgares da Índia, onde vive. Vão lá ver – tem bordados lindos! at Divânia‘s request here I’m showing the strings/twine I use in these bags O fio de juta é esse novelo maior; o novelo branco é um fio que aqui, em Portugal, se usa muito nas confeitarias e padarias; o fio norte é um fio muito forte para fazer embrulhos – não sei de onde lhe vem o nome – e é exactamente da cor do linho que uso nestes sacos redondos. The jute string is that big yarn; the white string is a kind of string most used in Portuguese confectioner’s shops and bakeries; the other string – here called north string, don’t ask me why – is a strong twine for packages and it has exactly the same shade of the linen I use to make these round bags. 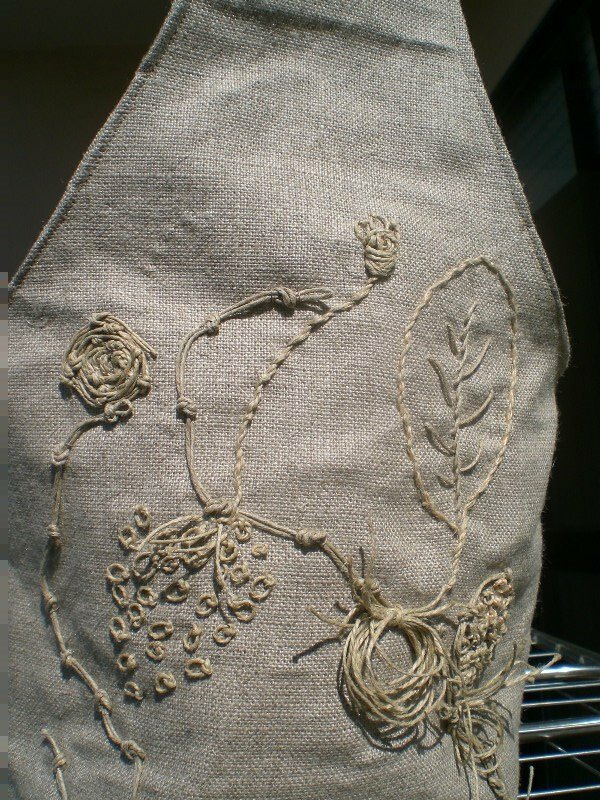 This entry was posted in bags and purses, bordado, embroidery and tagged bags and purses, bordados, embroidery by meri. Bookmark the permalink. Your embroidery is always so gorgeous, Meri. I love the design you stitched on this bag. This is very beautiful! what a great idea! what bautiful work! You are incredibly creative!